While we wait for Game Four tonight (which I hope is not the final game of the 2006-07 season), here are a few more thoughts on Larry Hadley, the legacy of the Spurs, and the trade of Juwan Howard to the Minnesota Timberwolves. A few days ago I posted some thoughts on the life and career of Larry Hadley. Yesterday I learned that Sports Illustrated also offered an obituary. Larry Hadley dies at 62: Famed sports economist was pioneer in baseball trade. Additionally, via Skip Sauer and The Sports Economist, I see that the University of Dayton has also offered some comments. The Economics of Baseball: A funeral Mass will be held on campus June 15 for Larry Hadley, an associate professor of economics, who made his mark analyzing the economics of America’s greatest pastime. 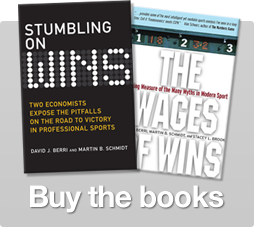 The Western Economic Association meetings – where many of the sports economists from around the world meet each year — will be held at the end of this month. As I noted, it was Larry who started these annual gatherings that have done so much for our field. Certainly these will not be the same without Larry. Robert Horry, who is on the verge of winning his seventh ring, says the Spurs can beat the Lakers and Celtics. This year, by my count, the Spurs were 2-3 against these two teams. But Horry was not talking about this year. He was actually talking about the Lakers and Celtics teams from the 1980s. Yes, Horry thinks the Spurs this year could beat the Celtics with Larry Bird and the Lakers with Magic Johnson. If we consider the efficiency differentials of these teams it’s possible Horry has a point. The 2006-07 Spurs boasted an efficiency differential of 9.1. The Celtics won three titles in the 1980s. Boston had a differential of 8.9 in 1986, 6.3 in 1984, and 5.6 in 1981. The Lakers won five titles in the 1980s, and posted the following differentials: 5.5 in 1988, 8.8 in 1987, 6.9 in 1985, 4.6 in 1982, and 5.5 in 1980. In all, the Celtics and Lakers won eight titles but none of these teams had a differential as great as the one offered by the Spurs this year. I am personally sympathetic to Horry’s general perspective, although I am not sure about including “Boobie” with LeBron, Duncan, Parker, and Ginobili. The average team in the Finals since 1974 has a differential of 5.7. The average for San Antonio’s opponents has been 3.7. To put that in perspective, the Chicago Bulls faced six opponents in the Finals during the 1990s. The worst of these teams – the Phoenix Suns in 1993 – had a differential of 6.5. The average team facing the Bulls had a differential of 7.5. Magic Johnson and the Lakers played in nine NBA Finals from 1980 to 1991. These nine teams had an average differential of 6.2. Interestingly Larry Bird and the Celtics, who got to play two very weak Houston teams in the 1980s, faced five opponents with an average differential of 4.4. So when we look at the quality of opponents the major dynasties faced, we walk away even more impressed by Michael Jordan and the Bulls in the 1990s. And we are a bit less impressed by the Celtics in the 1980s and the Spurs this past decade. And then we come to Kevin McHale. McHale has been the only general manager Kevin Garnett has ever known. And despite having one of the very best players in the game, McHale – as the following posts have noted – has failed to build a winner around KG. The Decline of Kevin Garnett? After winning only 32 games in 2006-07, McHale has to do something this summer. And that “something” begins with the off-season’s first trade. Marc Stein of ESPN reports that the Minnesota has sent Mike James to the Houston Rockets for Juwan Howard. According to the story, Garnett welcomes this move. Garnett, meanwhile, is expected to welcome the arrival of Howard, a 34-year-old former All-Star, after publicly calling — repeatedly — for more size in the Wolves’ frontcourt and more of a veteran presence in the locker room. It’s true that Juwan Howard is a large veteran. So if the objective was to add an older big guy, the mission has been accomplished. Unfortunately, if the goal is to build a winning team in Minnesota, this first move is not going to help. Juwan Howard’s shortcomings have been reviewed in this forum before. Still, it might be good to once again review his career. Howard has thus far been paid $130 million to play in the NBA. For this money he has produced 19.6 wins. Per win he has been paid $6.7 million. If all NBA players were paid at this rate the Association would be paying its players $8.2 billion each season. So clearly Howard has been a bit overpaid. When we look at the individual stats we see that Howard is an above average scorer. But he is an inefficient scorer. He also is the below average with respect to every other aspect of the game. And there is another problem with this signing. Minnesota had exactly two above average players last season. The first is KG, who was the second most productive player in the league. The other was rookie Craig Smith. Like Howard, Smith is a power forward. Although Smith is two inches shorter than Howard, he is much more productive as an NBA player (Smith produced 3.6 wins this past season with a WP48 of 0.113). Obviously if Howard takes minutes from Smith, McHale’s first move this summer has made a bad situation worse. Yesterday I noted that the Blazers of 1977 were led by Bill Walton. It was Walton’s immense production – not teamwork, team chemistry, etc… – that allowed Portland to field such an impressive team. It’s important to note, as I mentioned yesterday, Walton was not a one man team. Yes, he was the key to the team’s success. But there had to be other productive players on the roster to allow Portland to contend for the title. McHale has been given the equivalent of Walton. But unlike Walton, Garnett has been both productive and healthy. McHale, though, can’t find other productive players. Year after year McHale guesses, and year after year he guesses wrong. The trade for Howard will not be the last move McHale will make this summer. But the quality of this first decision suggests it might be another very long year for KG and the fans of the Minnesota Timberwolves. 9 Responses to "A Few Thoughts for Thursday"
The James for Howard trade is sensible. The Timberwolves had far too many guards/swingmen; they had far too few post players. They traded one of their many guards for something they lacked. Even if Howard isn’t that good, team need makes this a decent move. Craig Smith only played about 19 minutes a game. If this season, Smith doubles that amount (since he is the other productive player on the team), and Howard plays 19 minutes a game or less, the team will be more solid at post positions, hopefully giving Garnett the help he needs. But yes, the Wolves obviously have more moves to make if they want to make the playoffs (or they need to get improvement from within, which is possible with Smith playing more minutes and Foye getting better). I think we are going to disagree on this one. I can’t see how adding one of the least productive players in the league helps a team win more games. You may have had too many guards, but trading one of these for a player who cannot help you win games is not moving you forward. McHale will have to make other moves. Hopefully for your team, he will start making better choices. You’ve convinced me Howard isn’t a productive player. But here’s what I also see: the Wolves gave up a player they don’t need at all. They can replace James’ production by playing some combination of Hassell-Jaric-Foye more minutes (actually, they had better WP48 minutes than James, so more minutes for them and less for James theoretically improves the team). And I also see that the only two post players the Wolves had producing positive WP48 were Garnett and Smith. Mark Blount produced negative wins, so that means if he loses minutes to an non-productive Howard, a non-productive player is replacing a negatively-productive player. So, you’re right, Howard isn’t productive. However, the Wolves are so bad that his non-productiveness is an improvement over the negatively productive players they have! So removing James and his .023 WP48 means more minutes for other players on the roster with better WP48 minutes, and Howard’s .030 WP48 might mean less minutes for a guy getting -.045 WP48. No, I’m not ready to order playoff tickets yet. But a bad team just gave up a player it doesn’t need (and could be better without) and added a non-productive player (that could take minutes from a negatively productive player). The Wolves are so bad that Howard actually improves them. There is only one problem with your analysis. Blount is a double-digit scorer. I find it hard to believe that Howard’s minutes come from him. The article said the T-Wolves needed size. Smith is under-sized, that tells me that his minutes get cut. If Blount does lose minutes to Howard, you are correct that this is a good move. But I just find that hard to believe. I think we agree: if Howard cuts into Blount’s minutes, it can help the Wolves; if Howard cuts into Smith’s minutes, that will certainly hurt the Wolves. Smith’s points per 40 minutes were identical to Blount’s (and Smith was a superior rebounder and more efficient shooter). Hopefully the coaches realize that means Smith should be on the court. Then again, they didn’t figure that out last year, so perhaps I should fear they won’t figure it out next year. This trade actually dashed my hopes for a big trade for the Utah Jazz. I was hoping they’d talk to Minnesota about a KG trade. We all know they don’t want to trade KG, but Andrei Kirilenko is unhappy in Utah, and not performing at his potential. I figured they could offer the Wolves Kirilenko and Okur for KG and see what happened. Yeah, the Wolves are probably not trading KG, but an offer of two All-Stars (as iffy as one of those was) is probably the best offer they were gonna get. I think it would have been a good trade for both parties. KG is the one superstar that probably wouldn’t mind a trade to Utah, and the Jazz would have the best frontcourt in basketball with KG, Boozer and Paul Millsap. Minnesota would also do well, because even though they lose KG, if Kirilenko returns to previous season’s form, he replaces a good chunk of KG’s Wins Produced. And Okur, while not fantastic, is slightly above average, which is a huge improvement over Mark Blount. The frontcourt of Okur, Kirilenko and Craig Smith is a pretty decent one. Anyway, what little chance this trade had is now gone. I don’t see the Wolves trading for two power forwards right after trading for a power forward. Just another example of McHale not being nearly as good of a GM as he was a player. I’m not sure an efficiency differential of a team in 2007 can be compared with a team in the 1980s. Efficiency differential is just capturing how the team is relative to the rest of the league that year. We can’t compare the leauge 20 years ago with the league today. Bill Simmons made this point in the last chat on ESPN.com. While I think Simmons off-hand says a lot that can be easily debunked by historical statistics (and his predictive accuracy as a consequence is bad) he has a good pt on this. I don’t think its fair to only look at the Spurs finals opponents and say they’ve had it easy. They’ve been winning titles during a period when the league is lopsided, and they’ve been coming out of the much stronger west. This year their toughest opponent was Phoenix in the second round, I haven’t looked back at the other seasons, but I bet they beat tougher teams on the way to the finals than they did in the finals in a few, if not all, of their other runs. I agree that the discussion of efficiency differential is a comparison of a team relative to its contemporary peers. So when I compare the Spurs in 07 to the Celtics in 86, I am saying the Spurs are better, relative to their peers, than the Celtics were relative to their peers(although the difference is not very much). My sense, and this cannot be tested, is that today’s players are better than the players 20 years ago. And that was the point Horry was making. The Spurs in 07 probably are a better team, in absolute terms, than the 86 Celtics. Although, again, that can’t be tested. As for the comment on the Spurs opponents in the Finals… I would argue that the true Finals this year occurred in the second round when the Spurs faced the Suns. At least that was the closest we got to a contest between the NBA’s best. After the Suns, though, the Spurs did luck out this year. The Jazz were not among the very best. And the Cavs weren’t either. As for other years… I haven’t looked. So you might be right. That doesn’t change the quality of opponents they got to face in the Finals, though.